Free Form Sprite Layer is an example program, including source code, which shows an alternative way to gain a free form background layer. 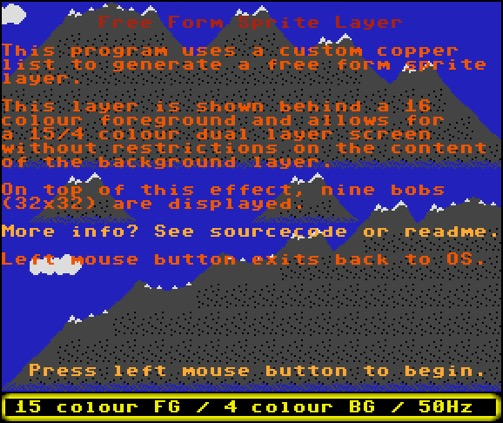 For more information, see Amiga Tech File #2 - Free Form Sprite Layer. The example is written in MC68000 assembly and contains full source code and all files used to make the program. *) Any emulator or Amiga computer compatible with the OCS/ECS or AGA chipset. Untested under Amiga OS 3.9, 4.0, MorphOs or other clones. Requires ~200KB of free chip memory.